Shaking up the social sciences…. For the past century, people have looked to the physical and biological sciences to solve important problems. The social sciences offer equal promise for improving human welfare; our lives can be greatly improved through a deeper understanding of individual and collective behavior. But to realize this promise, the social sciences, like the natural sciences, need to match their institutional structures to today’s intellectual challenges. I would submit that Krasnow’s own department of Computational Social Sciences represents just such an evolution. The Institute is now coming up on the 20th anniversary of the conference that set in place our scientific research program. It was held on May 24-26, 1993 here at George Mason University. The Conference was convened by the Institute’s founding director, Harold Morowitz, and was co-sponsored by the Santa Fe Institute. It was entitled: The Mind, the Brain and Complex Adaptive Systems. The speakers including the likes of Murray Gell-Mann, Herbert Simon, John Holland, Patricia Goldman-Rakic, Larry Squire and Daniel Dennett. As a result of that conference, the Institute’s unique focus at the intersection of neurobiology, cognitive psychology and computer science came to be and has led, over the years, to the vibrant trans-disciplinary mix of scientific inquiry that we have today. From its early beginnings in converted retail space located in downtown Fairfax, the Krasnow Institute developed a seminar series centered loosely on Cognition. That series that still exists today. Most every Monday at 4PM, the scientific and teaching community that make up the Institute come together–along with the invited public–to hear invited speakers talk for roughly an hour about their science. Many of those speakers have been famous (several Nobel laureates), but there have been many also just at the beginning of their careers who have brought their passion for scientific inquiry to the Institute. Many exciting scientific findings saw the “first light of day” at the Krasnow podium. In 1997 the Institute began to rapidly grow into its adolescent phase as it moved into the first part of the current 50,000 square foot facility on a wooded slope of George Mason University’s campus. With that move, came real wet laboratories and the chance to have experimental science become a significant part of the Institute’s activities. The new space created a virtuous circle of accretion–new talented investigators conducted and published research which lead to the recruitment of still more talented scientists. By the turn of the century, the Institute was bursting at the seams and plans began for a really significant set of laboratory expansions that would eventually lead, by the end of the decade to the the formidable physical plant that currently anchors Krasnow’s science and education programs. The further growth of the Institute was really made possible by the full merger of Krasnow into George Mason University in 2002. By 2007, Krasnow had become a unique academic unit of George Mason, holding its own faculty in two departments, Molecular Neuroscience and Computational Social Sciences, in addition to playing a seminal role in the development of the University’s neuroscience programs and hosting the first doctoral program in computational social sciences within the United States. That an academic unit is embedded within an institute for advanced study is probably also close to unique. Beyond the notion of integration between teaching and advanced studies, the Institute was also unusual in that it came to also house full voting faculty who were not members of either department, but had their primary appointments from across the University–the common thread that bound it all together was the commitment to reaching across disciplinary boundaries to work on the problem of cognition. Two other scientific themes emerged. The first, was complexity science, recognizing that cognition and human behaviors are themselves emergent from complex adaptive systems. The culture of complexity science ran deep of course–the Santa Fe Institute had played an important role in getting the Institute started. The second theme was the role of computational modeling grounded firmly in experimentally-derived data. From computational modeling of signal transduction mechanisms underlying reward and addiction to large-scale models of economies and political societies, this approach has proven both fruitful and a way of differentiating the Institute from many of its sister centers across the globe. The Institute also acquired a dedicated cadre of volunteers who brought their multitude of talents and accomplishments to the Krasnow Advisory Board. Led by Dr. Adrianne Noe, Director of the National Museum of Health and Medicine, that Board grew over time and now plays a critical role in the crafting of a vision for Krasnow’s third decade. The value of their contributions, both in terms of wisdom but also as manifest in generous philanthropic gifts has been central to the Institute’s success. These are exciting times to be serving as Krasnow’s director. In addition to the Institute’s own visioning process, Krasnow will be playing an important role in the crafting of a new strategic plan for George Mason under its new President, Dr. Angel Cabrera. 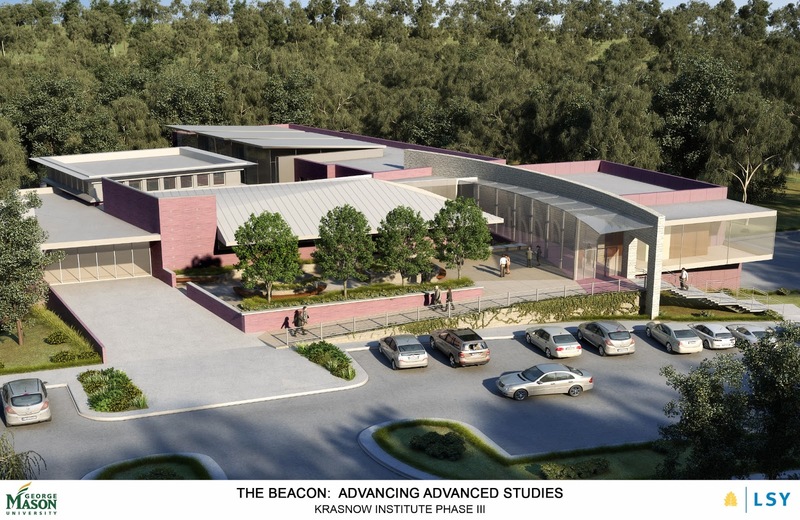 A major third decade goal for the Institute is a new expansion wing on the south-end of the current facility that will house the Institute’s departments, several of its centers and a new auditorium that will serve as a beacon for the entire campus. The Institute for Advanced Study will continue to build upon its strengths, and energetically pursue new strategic opportunities in the years ahead. I’m really pleased at the progress that we’ve made, but even more excited about what lies ahead. Happy 20th! From John Brockman’s The Edge, it’s here. Dan was one of the initial intellectual founders of the Krasnow Institute for Advanced Studies. Here is a long-piece interview with him on the very subject that is central to our research program: the human mind. One idea that I agree with him about: the notion that our early notions of neurons as simple switching devices was vastly over-simplified. Dennett here calls them “little agents with an agenda”. One odd thing about the scientific process itself: unlike industrialization, scientific productivity doesn’t really lend itself to the sort of efficiencies that drive many business texts. Which is not to say that convergent technological advances haven’t been hugely important in driving recent progress in science–particularly in science of the trans-disciplinary variety that we do at Krasnow. Rather that a central part of science success comes directly out of contemplative thinking about information/clues from the very edge of human knowledge. To be perfectly clear, a successful scientist needs to allot significant periods of time for quiet thinking. For myself, one of my own successes in neuroscience came directly out of the realization from my thesis work that imaging metabolic rates in brains wasn’t going to be very useful for imaging learning and memory because those metabolic rates had very high between- and within-variabilities. I needed instead to image the activation of a molecule that was central to mnemonic function (think close to rate-determining) so that the experimental signal-to-noise could be improved upon. That quiet thinking led me to consider protein kinase C less than a decade after it had been discovered within the context of cancer. But there are roles for efficiencies in science. The advent of new general purpose simulators for computational neuroscience combined with Moore’s law, make for in silico experiments that take minutes rather than weeks. Robotics allows genome-wide analysis for a small fraction of the cost of Craig Venter’s initial success with his own DNA more than a decade ago. There are also roles for efficiencies in the administrative support that we provide to scientists. One important consideration is the ever-increasing burden of regulations that, if not checked, can literally eat away at the time a scientist can devote to creating new knowledge. There is of course an important balance between compliance work done to protect society from scientific mistakes (of many types) and the scientific process itself (work of directed creativity). At this institute, we do our level best as administrators to shield our scientists from as much as possible of the regulational burden, by taking it on ourselves–but there are certain areas where that is not possible (such as certifying that a project has no conflict-of-interest). A part of the life of the very best scientists is close to dreaming. New seemingly random pieces of data (and knowledge) are fitted up against conventional ideas to create novel “idea combinations” (hypotheses) which then can be tested at the bench. Dreaming has never been a good metaphor for efficiency, but it may well be pretty good for describing what it is to scientifically break open a new paradigm. This has been a quiet week here at George Mason–the campus has definitely entered the summer slows, with less traffic (both of the motorized and animal types). This in spite of the campus excitement from our sister institution to the south. At Krasnow, I’ve taken advantage of the quiet to work on several projects that require reflection, while at the same time, touring laboratories to keep in touch with the various scientific programs at our institute. I’m continually amazed by the research at Krasnow–it’s both imaginative and demanding–exactly what we want at an institute for advanced study. The weather has seen fit to mark the astronomical solstice by reverting to the normal summer Washington DC pattern of extreme heat and high humidity. It’s definitely a good time for air conditioning. Next week however things change. I’ll be at the National Science Foundation early in the week for a workshop on convergent technologies and then out to Sandia National Labs midweek for a review of the cognitive sciences program finishing up with a quick meeting at the Santa Fe Institute to talk about future collaborations. If I’m lucky, I’ll get back before midnight on Friday. I’m hoping to get some good blog posts in from the road to break things up. The annual science retreat at Krasnow…. Tomorrow, Krasnow Institute faculty, postdocs and graduate students come together for our annual two day science retreat. We come from disparate fields ranging from theoretical physics to computational social science. We have wet lab experimentalists, in silico modelers, brain imagers and behavioral economists–among many others. Our students are pursuing PhD’s in neuroscience, bioscience, computational social science and psychology. Tomorrow, we “walk the walk” of transdisciplinarity. It’s very difficult to get into the technical details of disciplines that are different from our own, but it’s surely implicit in what advanced studies are all about. The potential payoffs for the difficult work are immense because–I believe– the big paradigm breaking discoveries, lie at the boundaries of disciplines. I’ll be live-tweeting the retreat tomorrow with the hashtag #krasnowscience and as will, I imagine, some of our other social networking scientists and trainees. Hope you’ll follow us on twitter. Another year in the books…. This is commencement week at George Mason and marks the end of another academic year at once of the most dynamic higher education institutions in America. I continue to be amazed at the growth of this place. With the Washington DC area topping many of the human development metrics, it’s easy to imagine what we might look like in a decade or two and be filled with optimism. Here at the Krasnow Institute for Advanced Study, we’ll be celebrating the minting of new PhD’s, our first short-course collaboration with the Santa Fe Institute and a incredibly intense scientific year. Our final Institute seminar brought Nobel Laureate, Bert Sakmann to campus. Our PI’s work on areas ranging from molecular neuroscience to complex simulations of labor markets, all with the common themes of complexity and cognition (writ large). Next week, we come back and head into our annual science retreat where we walk the walk of transdisciplinary scholarship. I’m really looking forward to it. Finally, there’s the professional satisfaction of seeing some of my fine neuroscience undergraduate students stand up and be awarded their bachelors degree this Saturday. Priceless.